That's the cheezy-but-true title of the presentation that I'm giving today at West Marine. 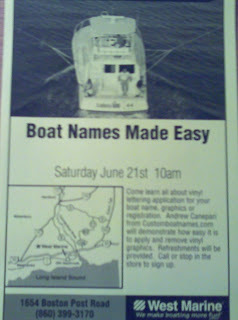 I'm going to show people in person how easy it is to order boat lettering online, and how easy it is to install the lettering. If you're not doing anything at 10 am, or an hour before or after, please stop in and say hello. It's the West Marine at 1654 Boston Post Road in Old Saybrook, Connecticut. Right next to the Cuckoos Nest, which, by the way, is where I'll be after my presentation.